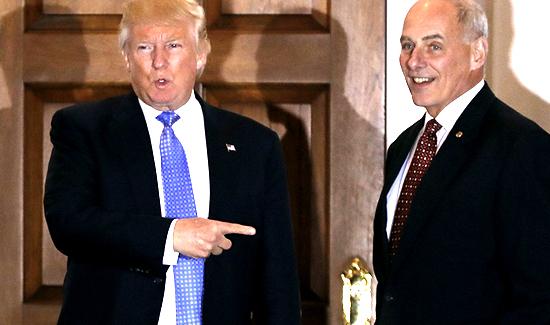 Homeland Security Secretary John Kelly (right) says homegrown terrorist attacks are the most common, but he doesn’t know how to stop them. It’s very hard to get sense of how much we’ve spent on the sprawling, wildly disorganized bureaucracy known as the Department of Homeland Security since 2001. Lowball estimates are about half a trillion. It’s even harder, despite many taking a crack at it, to know what it is DHS actually does. Not even the inspector general of the agency (so long as he or she still has a job) can say for sdure what the mission of the agency is. But what is increasingly clear is that the big government agency DHS (with close to a quarter of a million employees) is at least being honest about the fact that it just doesn’t know what it’s doing. DHS Secretary Kelly gave an interview over the weekend in which he pointed out that he doesn’t understand and has no plan to deal with the most serious threat facing Americans—homegrown terrorism. “Obviously, you got the homegrown terrorists. I don’t know how to stop that. I don’t know how to detect that. You got other terrorist threats that come across the border,” John Kelly told CBS. One might think that in the 22 years since Timothy McVeigh and Co. bombed Oklahoma City, people in Kelly’s position might have given homegrown terrorism some thought. But the great thing about not having a defined mission is that you don’t really have any defined responsibilities. In addition, Mr. Kelly seemed almost apologetic about the idea that people might want to focus on the largest threat. “If you see something, say something. Whether you’re a parent, a sibling, an imam. And this extends frankly, John, to white supremacists and that kind of terrorism as well,” Kelly said on Face the Nation. Some might say spending more than $500 billion on an agency that doesn’t know what it does and says it’s just waiting for people to “say something might be a little on the pricey side. All we know is we have to keep paying for it.